The Internet Corporation for Assigned Names and Numbers (ICANN) is planning to increase the current selection of domain names beyond the generic top-level domains like .com, .net, and .org. 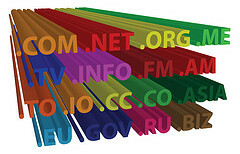 In anticipation, many companies have already begun to apply for their own brand name domains. The costs of placing an official application and paying for the accompanying legal and consulting fees for one of the trendy domain names can reach upwards of 1 million US dollars.